Ridgefield's Inaugural Women's Flag Football League Kicks Off Season, Still Time to Register! Women's Flag Football in Ridgefield? That's right! 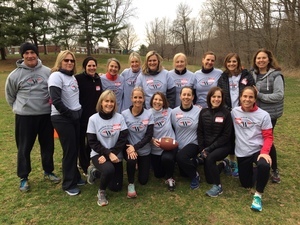 The first-of-its-kind in Connecticut flag football league for women kicked off their inaugural season last week at Scotland School field. The season will run in consecutive Thursday evenings through June 6. “It’s all about fun, football and friendship. We will get exercise and laugh. This is our time!” says Briody.